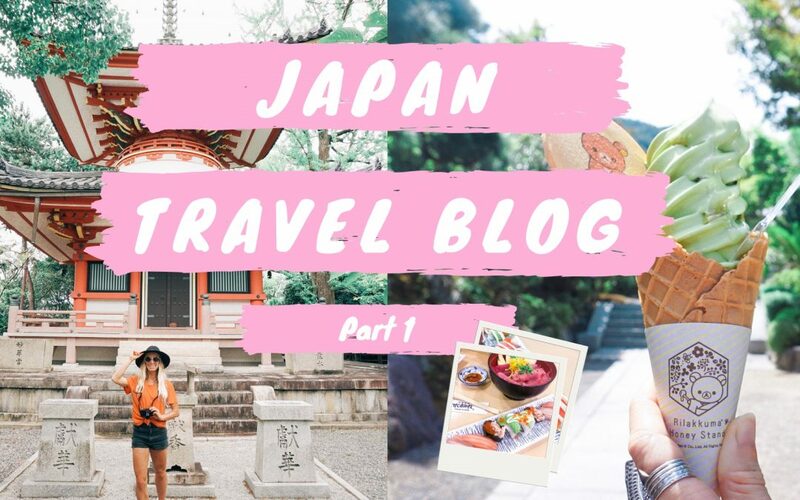 After our recent trip to Japan (August 2018), I’ve had so many requests for our travel itinerary, what to eat, where to stay and what to do, so without further ado, here it is! 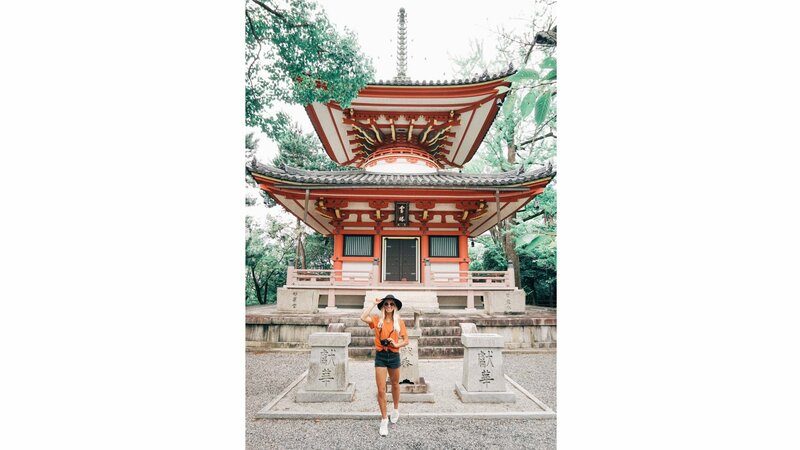 The number of nights we spent in Tokyo and Kyoto were perfect for what we wanted to see. 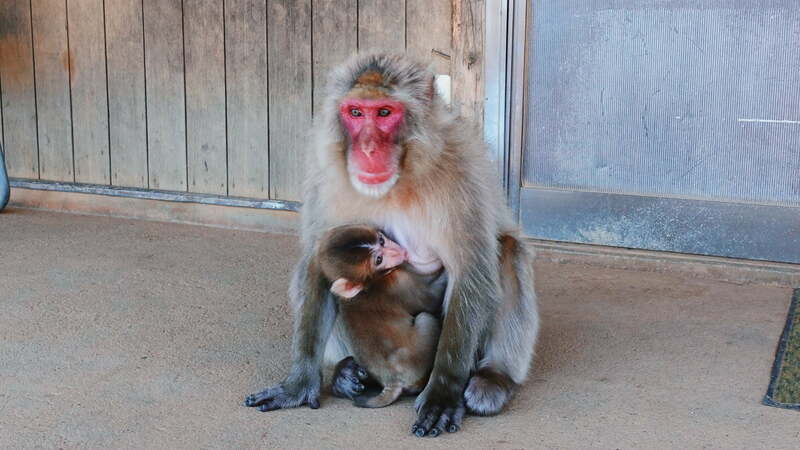 We would definitely suggest minimum 5 nights for Kyoto as there is a lot to see and do! If we were to re-do our trip, we personally would have changed the 3 nights from south Okinawa and spent them up the northern end. We felt Northern Okinawa was much more peaceful with beautifully preserved beaches and snorkelling spots, where as the South end was busier with a large U.S. military influence. Kyoto Granbell Hotel – great location right next to the old city Gion. 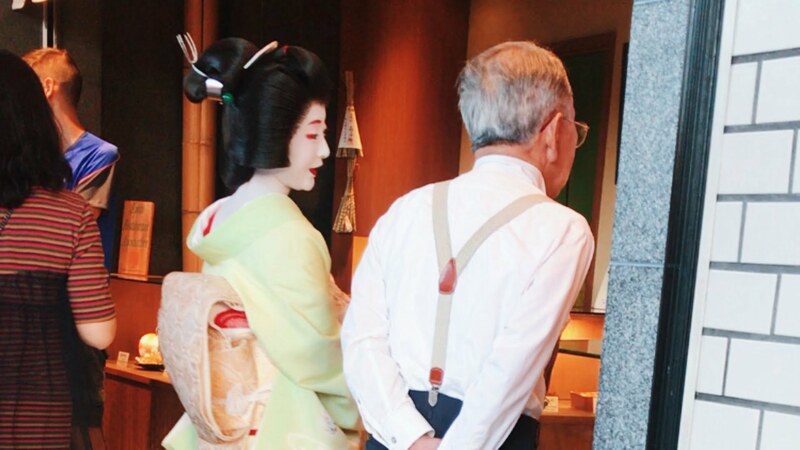 It’s in very close walking distance to Maruyama Park and Yasaka Shrine (where you can walk/run/hike and explore beautiful shrines), Higashiyama District packed full of traditional Japanese sweet shops and Gion where you can see Geisha. MOK Igusa Villa – located in the Ogimi Village in Okinawa, a famous “Bluezone” villiage where residents live the longest & healthiest in the world. Beautifully deisnged with traditional Japanese bed and dining. The food in Japan was AH-MAZING! 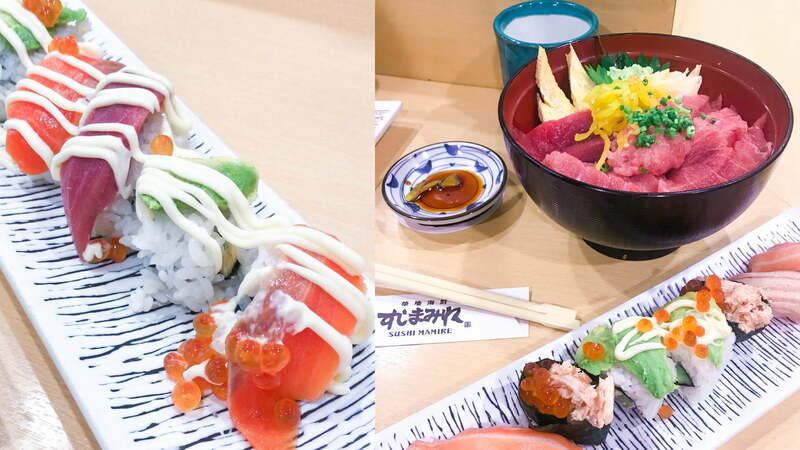 Tokyo is sushi capital and had the most delicious sushi we’ve ever eaten! 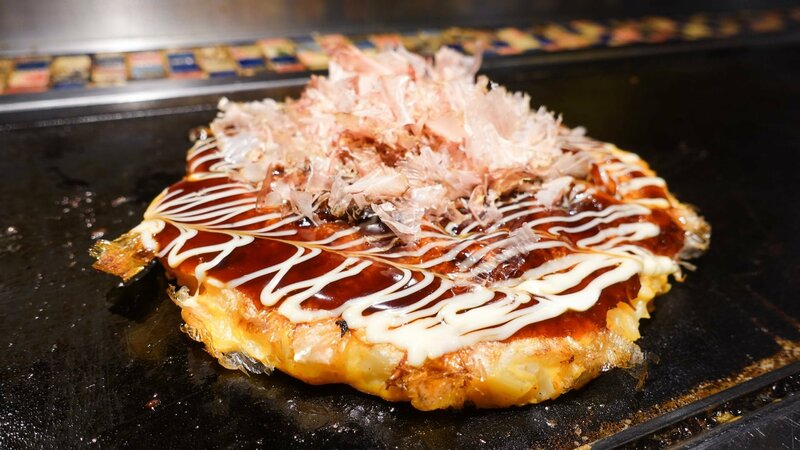 We also had lots of okonomiyaki (traditional Japanese savoury pancake) & sashaimi. 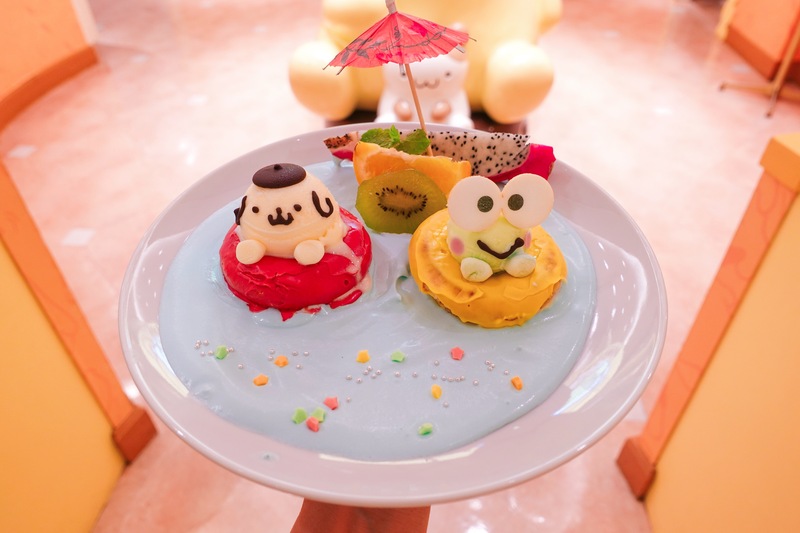 In Harajuku, we visited some of the fun café’s like Pompompurin Café. Must visit the Pontocho Food and Drink district! This is a long narrow, cobbled alley lined with incredible Japanese restaurants. 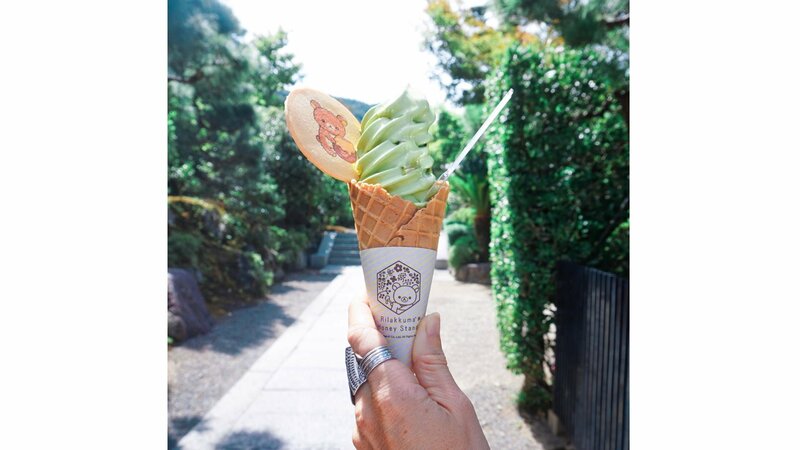 Also visit Higashiyama District which is packed full of traditional Japanese sweet shops with free taste testing! My favourite sweet was Mochi, pictured below. We found Kyoto had less sushi & sashimi options and more meat than Tokyo (we don’t eat meat), however there was definitely still enough fish and vego options available for us! Food Shopping – Instead of big supermarkets, Japan has Family Marts and they are everywhere! You can pick up a variety of things form these, including cheap and delicious sushi and salads which we did quite often for a cheap lunch or dinner. They also sell alcohol if you want to pick up cheap drinks. Fruit – we did find it difficult to find fresh fruit in Tokyo and Kyoto. When we did come across fruit, it was extremely expensive compared to fruit in Australia. To make up for this, I picked up quite a few fruit and veggie juices from the Family Marts. 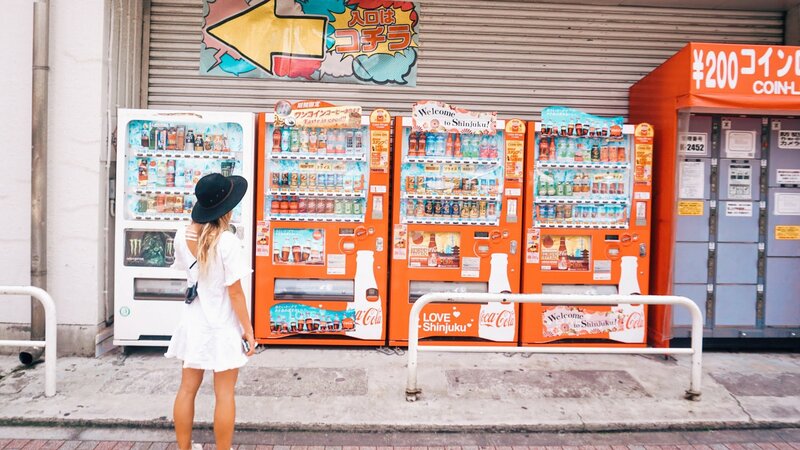 Coffee – Japan has vending machines on every street corner, which is where we got our coffee from each morning. See picture below. 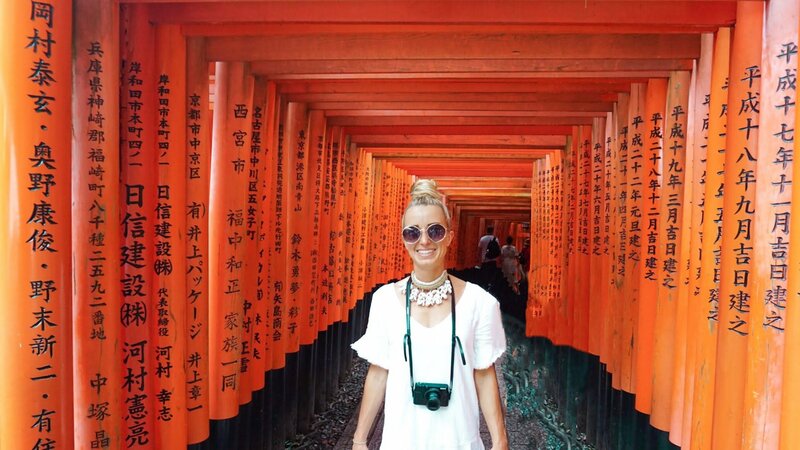 Walking around, looking at city and eating sushi was what I loved about Tokyo most! 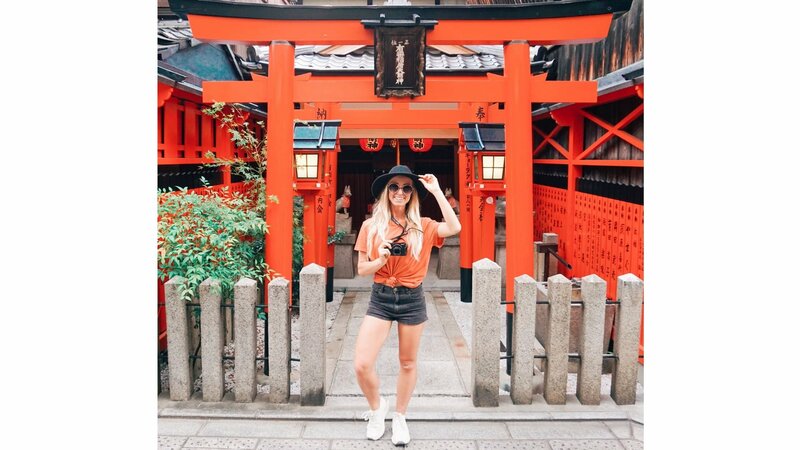 Tokyo is so bright and colourful and there is so much happening wherever you look! Harajuku are, which is between Shinjuku & Shibuya, is an experience I would recommend to! It’s full of fun, out-there culture, shopping and themed cafes & restaurants! My favourite was Pompompurin Café. We also visited Yogi Park which is a great spot for a run or a workout. Gion – kyotos most famous Geisha district. Preserved streets filled with shops, restaurants & traditional tea houses. Pontocho Food and Drink district where we had dinner each night. This is a long narrow, cobbled alley lined with incredible Japanese restaurants. 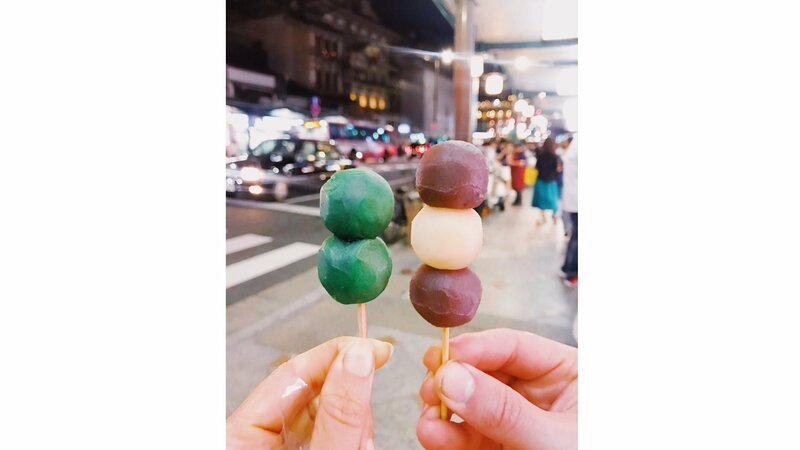 Higashiyama District – packed full of traditional Japanese sweet shops with free taste testing! 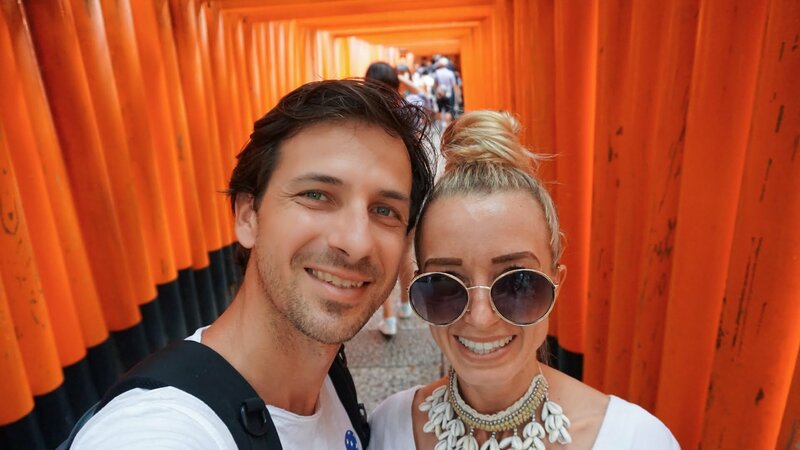 Fushimi Inari-taisha Shrine – there are over 10,000 gates and 12,000 steps…wear good waking shoes! 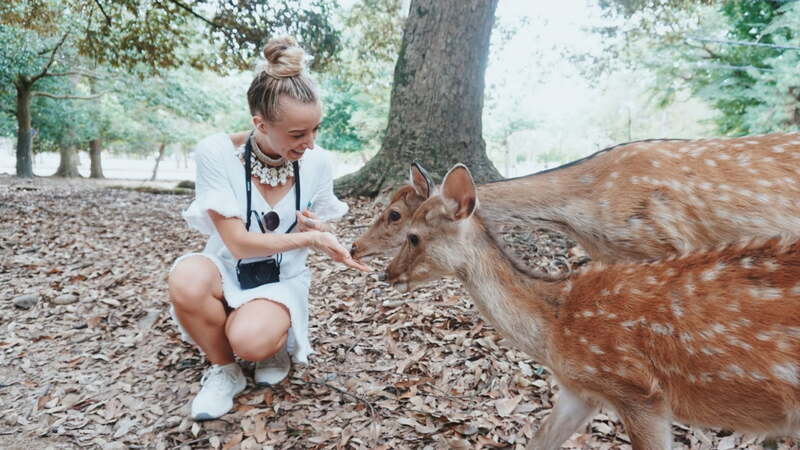 Nara Deer Park – packed with hundreds of freely roaming deer which bow to you when they want food. Maruyama Park – beautiful place with hundreds of shrines, including Yasaka Shine. Great place to walk, hike up the mountain or go for a run. Your holiday looks wonderful! Thanks for sharing! Your Japan trip and food looks great. I heard Japan was a great country to visit, one day I may make it. All the best, Gazza.